Rosewood Ranch features a horse-riding drill team, one of few such teams in the United States for people with developmental disabilities. Comprised of six horse riders and three alternate riders, the Rosewood Drill Team made its debut at Great Bend Expo III Arena during the 9th Annual Rosewood Rodeo, Oct. 18, 2013. Completing the 11-minute performance, which consisted of 22 formations changes, drill team members received a standing ovation from the Rodeo audience following their performance. Rosewood Drill Team practices on Thursday afternoons at the Rosewood Equestrian Riding Facility at Rosewood Ranch. The team is coached by Rosewood Studio Arts manager Debbie Warren, a longtime collegiate cheer and dance coach. Participants are also coached by Rosewood Ranch’s expert riding instructors. 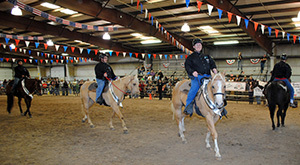 Drill team riding is a relatively new experience for the participants who have all been therapy riding and participating in horse shows for quite some time. The Rosewood Drill Team performs at the 9th Annual Rosewood Rodeo pictured in foreground is Josh Trimmer on Rocky, Chris Devine on Ozzy and Krystal Thorne on Flasy. Other Drill Team riders and horses are: Jesse Kerns/Clyde; Mary Minear/Daisy Duke; Melissa Trimmer/Moe. Serving as Rosewood Drill Team alternates are Charles Bortz, Shaun Ledesma, and Josh Pike. Pictured in the background of the performance is Debbie Warren.